Posted by Jenny in camping, hiking, nature. 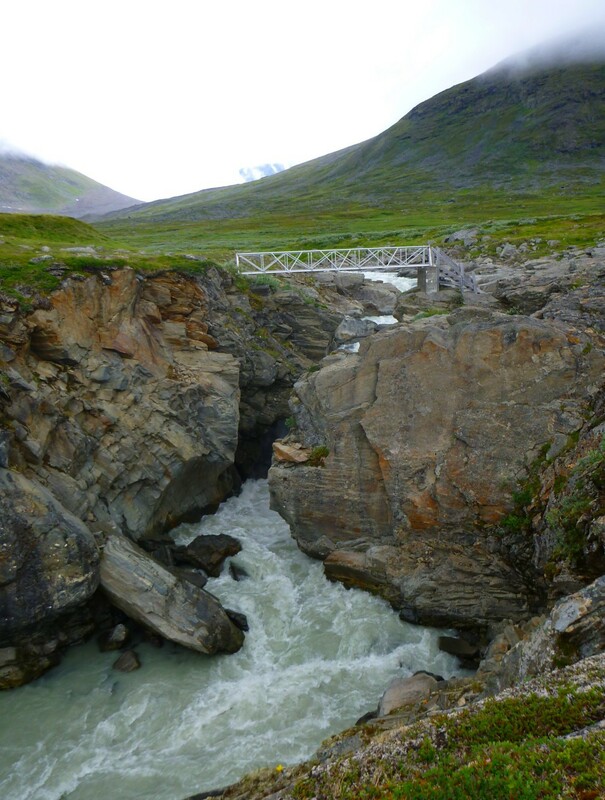 One of Sarek’s two bridges. We were glad it was there. Day Five began with the novelty of walking a short distance without our heavy packs. 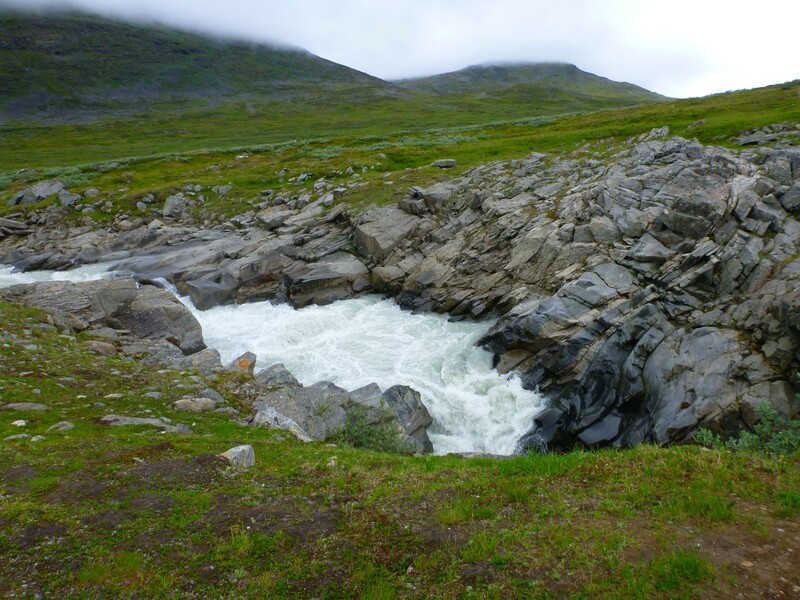 Just downstream of where we had camped, the river flowed through a deep narrow gorge, and Christian took us to see it. We crossed the bridge pictured above and walked beside the river. The gorge was so deep and narrow that it was hard to get a picture of the water running through it. Christian warned us to stay away from the edge, telling us about two Polish hikers who had come here in the winter. One stood on a block of snow at the gorge that turned out to be an overhanging cornice. It collapsed beneath him—and he was gone forever. 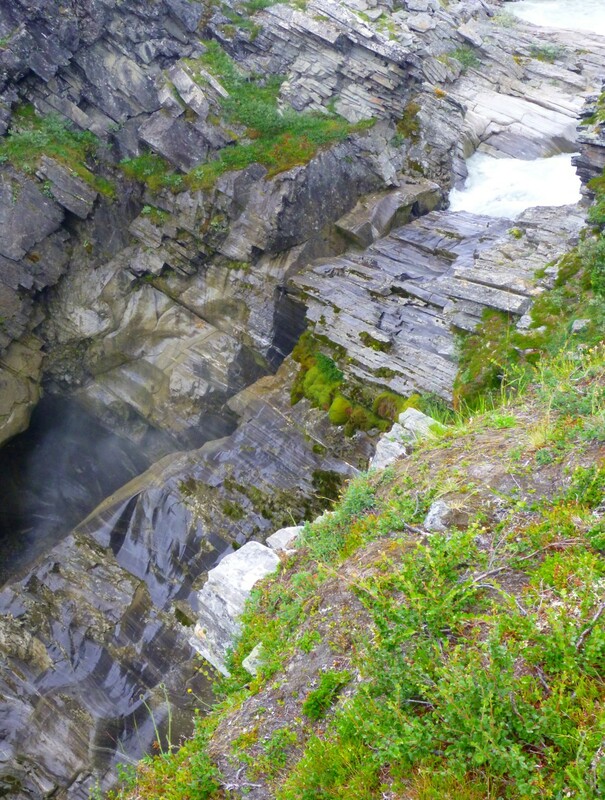 In this picture, what looks like a block of white rock or snow toward the top is actually milky-colored water. Swirls of mist rose from the gorge, and the water raced onward. Today’s outing would be a short one. 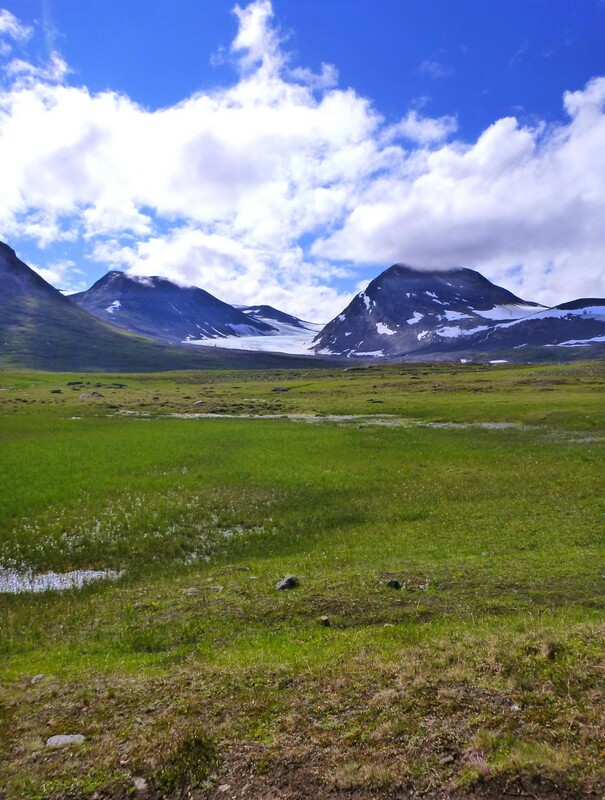 Rather than continuing south into what eventually becomes the great Rapadalen valley, we turned east toward a large lake, the Bierikjavrre. 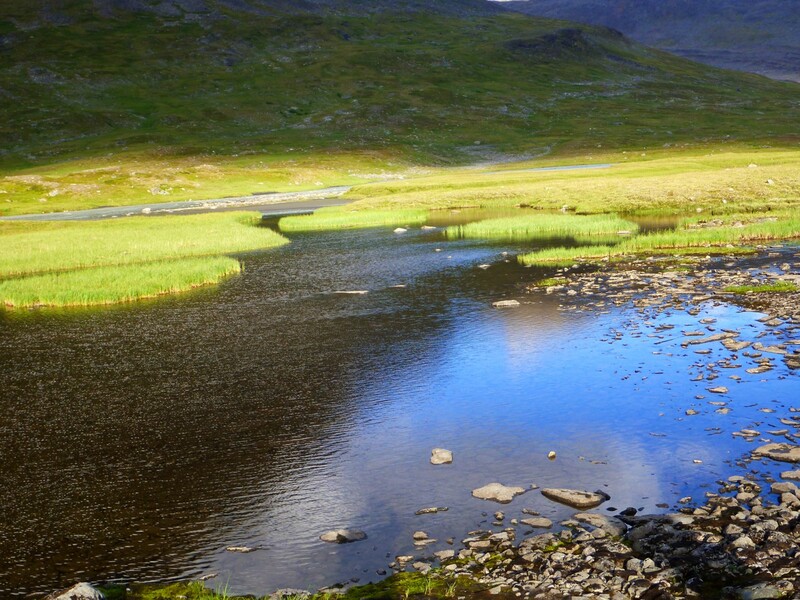 We would arrive early enough to relax and maybe have a bath in one of the smaller lakes in the vicinity. 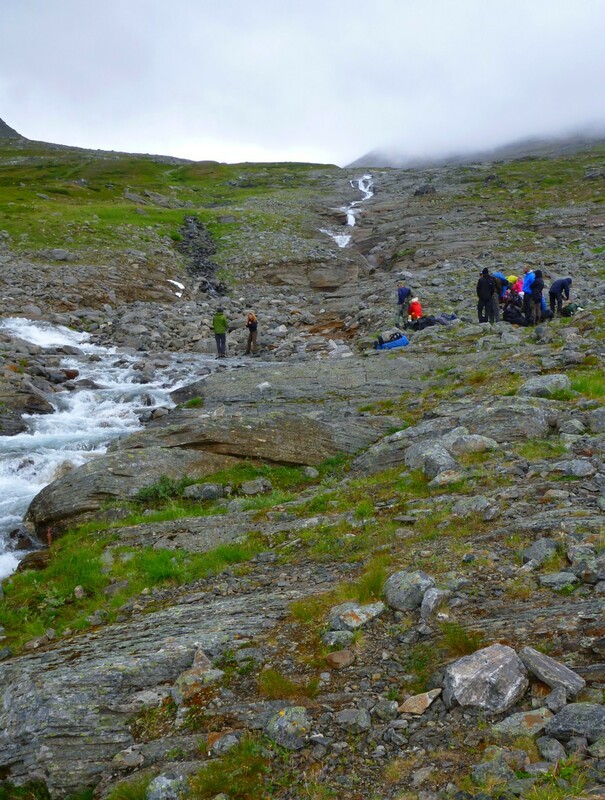 Then the next day we would do a day trip to climb the mountain Låddebakte and return. From that peak, we’d have views down into the Rapadalen, which has been described as one of the most beautiful river valleys in Europe. The day before we’d met a group of hikers coming the opposite way, and Christian asked them about the current condition of the stream crossings. They said we’d have one slightly difficult crossing, but they had put up a stone cairn to mark a good place to get over. I looked at the map and saw two crossings. 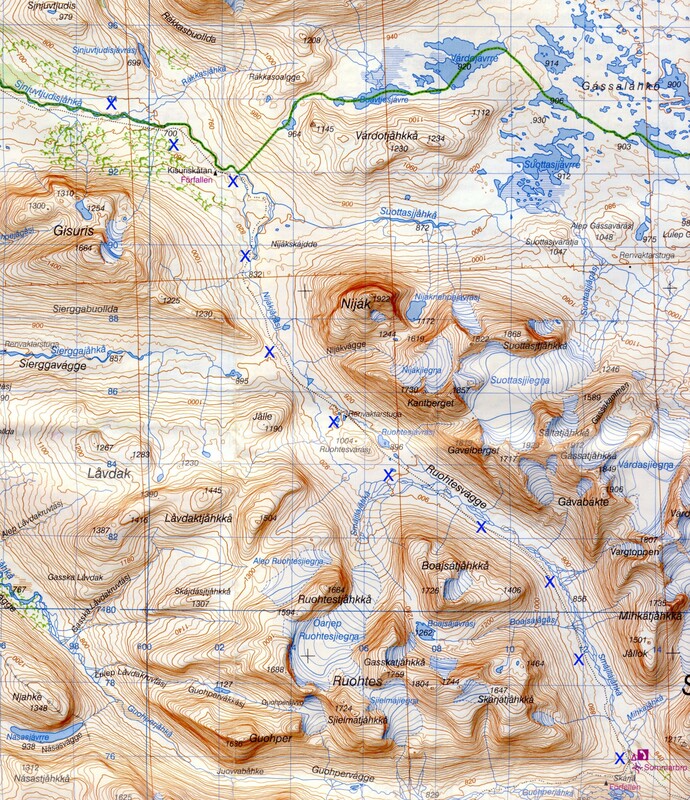 The streams were drawn with very narrow blue lines. I couldn’t see how they could pose any problem. 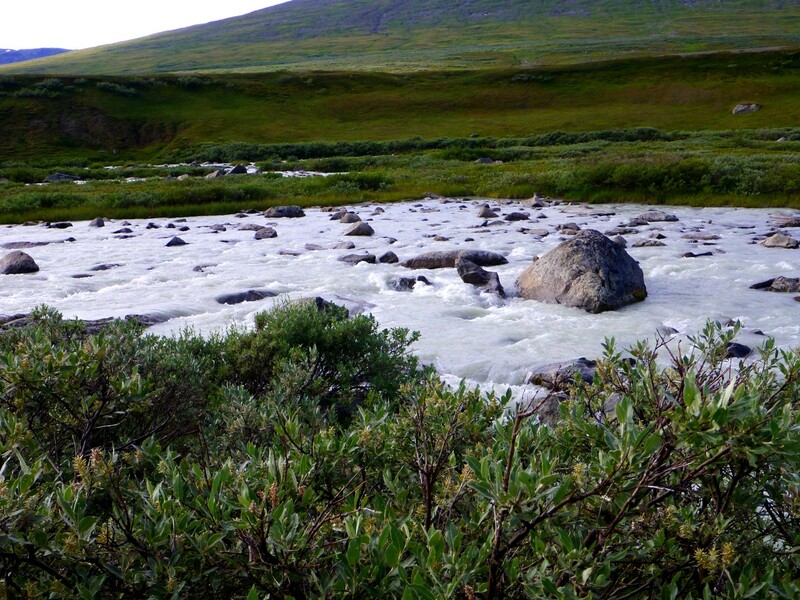 I still hadn’t figured out something pretty obvious: it all depends on the size of the glacier at the top of the stream. Before long we came to the first stream. A cairn had been placed beside it. Oddly enough, it had not been placed at what was clearly a better spot to get across. We went to the easier place and got across with no trouble. Perhaps those other hikers had found it difficult because they’d picked the wrong crossing spot? At any rate, I felt smug. I had clearly mastered the art of these crossings. No problem at all! The folks who changed to water shoes regroup on the far bank. I, of course, left on my Merrells, as explained in the last post. 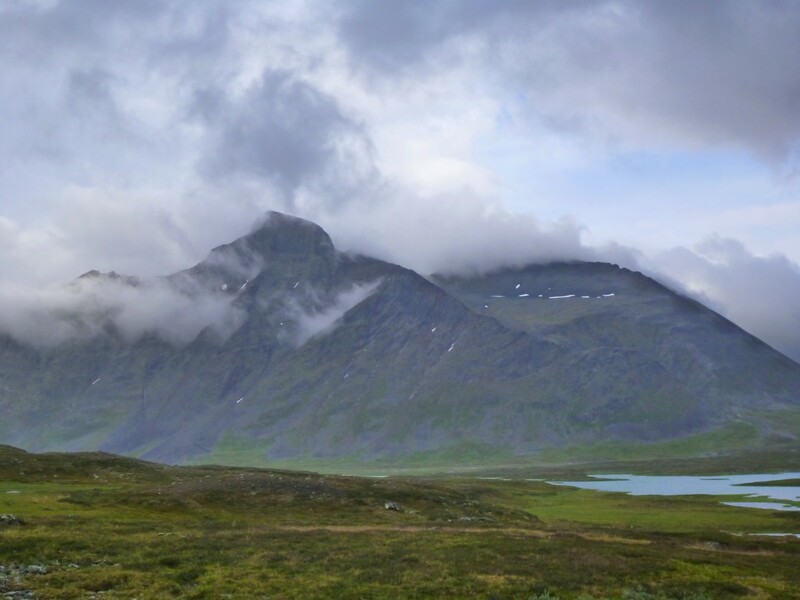 The mountains were lovely even with their tops shrouded in clouds. Before too long we came to the second stream. And suddenly I realized, with fear in the pit of my stomach, that this was the difficult crossing. I could see that the way wasn’t bad as far as an island in the middle. But the side past the island looked deep. It foamed with fast-moving current. A few people crossed before me. I watched where they put their feet and decided, “Okay, let’s get this over with.” I got about halfway across the hard section and started to wobble. My heavy pack was once again trying to pull me over backward. Christian came across to me and offered a helping hand. With his steadying, I made it across. Whew! Jonas wades thigh deep, while Jarl waits for his turn. Anders stands by in case assistance is needed. 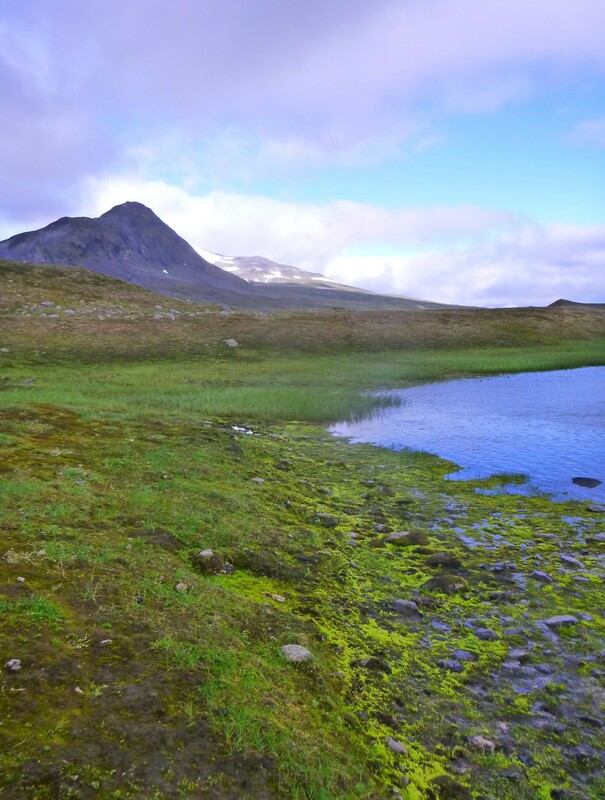 We crossed a boggy area and left a well-used track to get up to the chain of lakes that was our destination. Sometimes we picked up game paths, other times human paths. 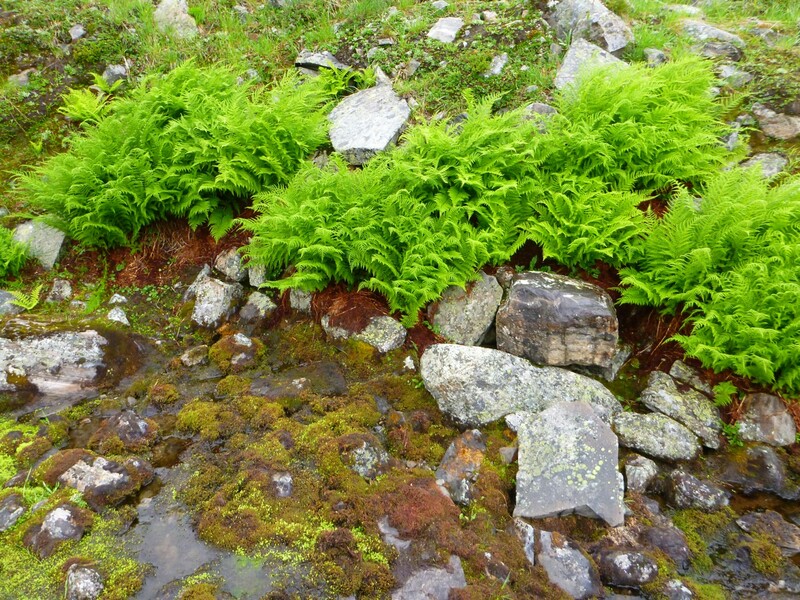 They braided in and out between bits of bog. We arrived at our campsite with a few hours to relax however we chose. Some went for a swim in the closest lake, but it was too chilly for me to do that. 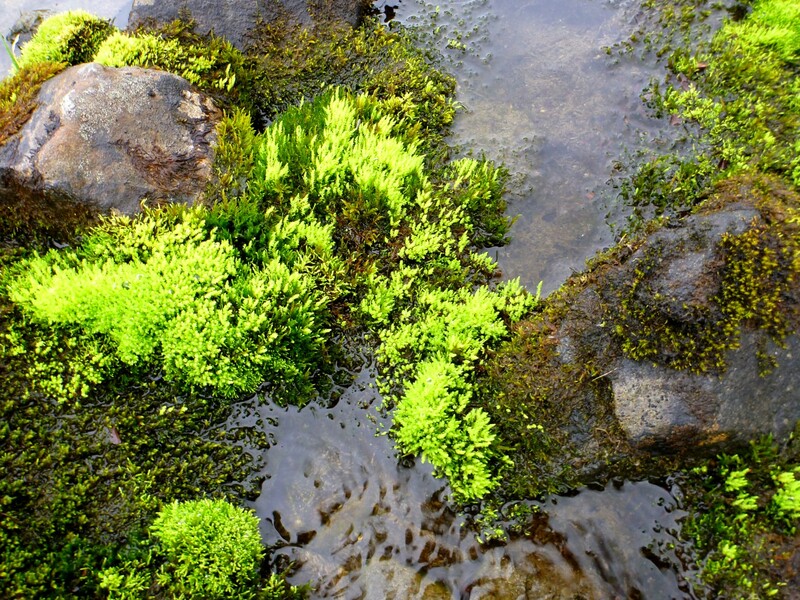 I wandered about taking pictures of plants. 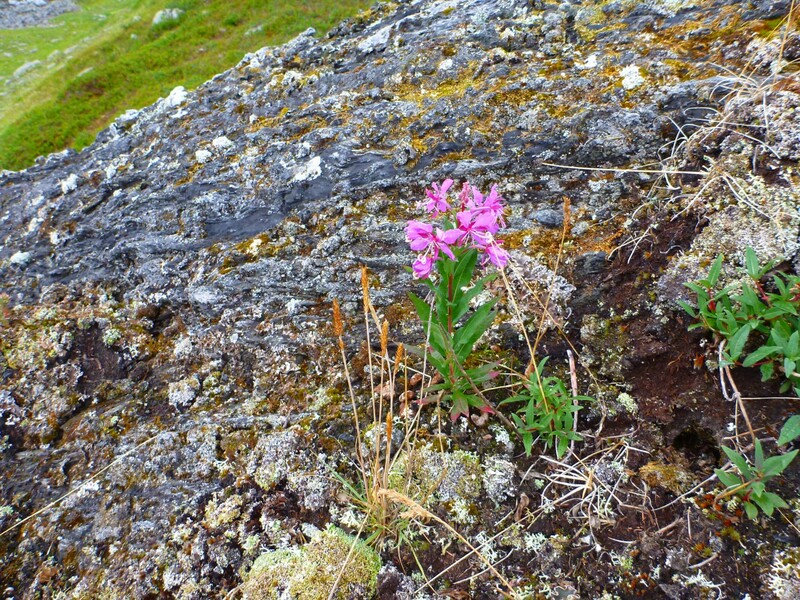 This flower seemed to grow right out of the rock. Well, the trouble with the quinoa was that it took forever to cook. We boiled it for about 15 minutes, and it tasted crunchy. As in, it tasted as though it hadn’t even been cooked. So we boiled it. And boiled it. And it was still crunchy. Finally we gave up and ate it with whatever sauce was supposed to go with it—I forget what that was. Afterward Christian went around to our tents and said, “I’m going to tell them [the folks at STF in Abisko] not to give us that again! Uses up too much fuel!” “And it doesn’t taste good either,” Jarl and I agreed. I applaud the “super-food” concept, but this wasn’t good for a backpacking trip. Perhaps if it was pre-cooked and then freeze-dried? And served with something truly delicious? I looked forward to the next day. Finally, we were going to reach the summit of a mountain! Posted by Jenny in camping, hiking, travel. The night of the third day was, I believe, the night we all had pasta. The great thing about this dinner had nothing to do with its flavor. It was that we got rid of most of that darned bulky pasta that had taken up so much space in our food bags. In the morning I was able to rearrange my pack so that my sleeping bag was on the inside of my internal-frame pack instead of strapped to the outside. We followed a program in our dinners. Not only did this give us a feeling of togetherness, but also, Christian had a grab bag of condiments stashed in the depths of his pack designed to go with that evening’s dish: dried mushrooms or garlic, for instance. He would go around the campsite as each pair of us sat boiling our water beside our tent, and cut a clove from the garlic for each of us with the picturesque knife he wore in a sheath attached to his wide, medieval-looking belt. After my stream-bath that day, I had hoped to dry out my clothes a bit, but there was a tad too much dampness in the air for that to be of use. When I woke in the morning, I saw sunlight shining through the tent. I stepped outside only to see that mist and sun were rolling alternately across the valley. It was beautiful, but not good for drying clothes. In the morning Christian gave us a talk about navigation and compass-work. He didn’t warn us at the time, but he would give us a test later on in our trip. 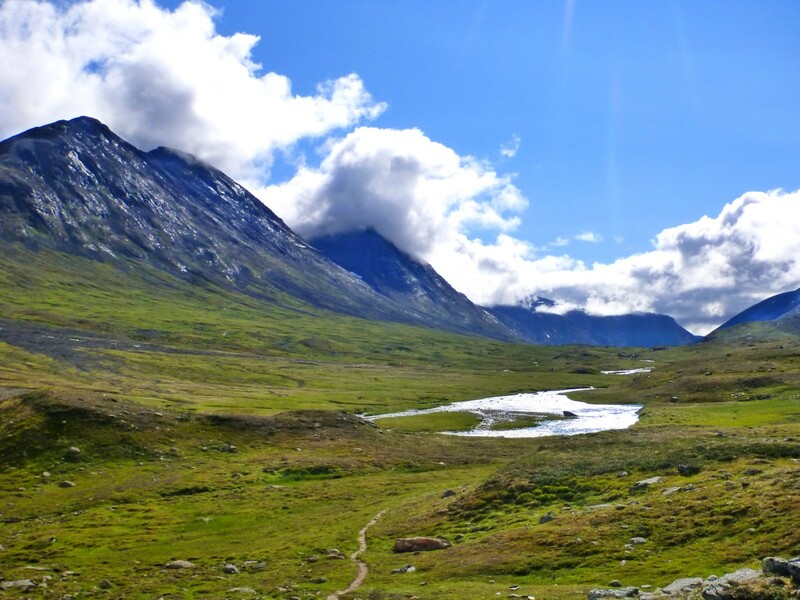 We packed up and proceeded southeast down the Ruohtesvagge valley. 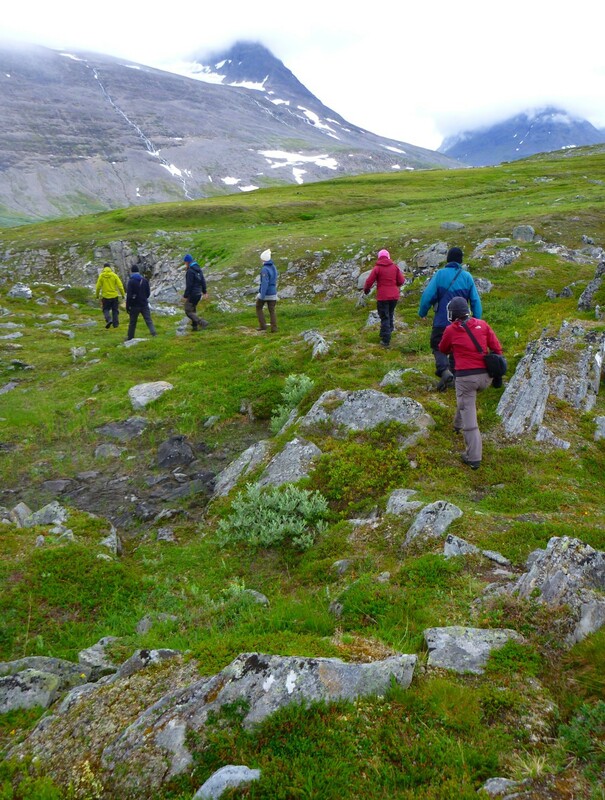 We were able to follow an unmarked path most of the way along this major corridor of Sarek. 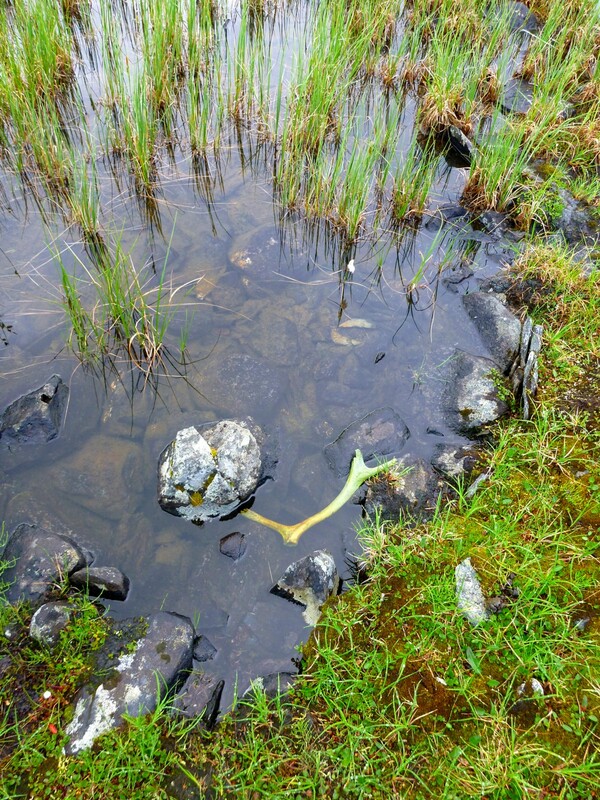 It remained clear except in marshy areas. You can see the “herd path” in the foreground. 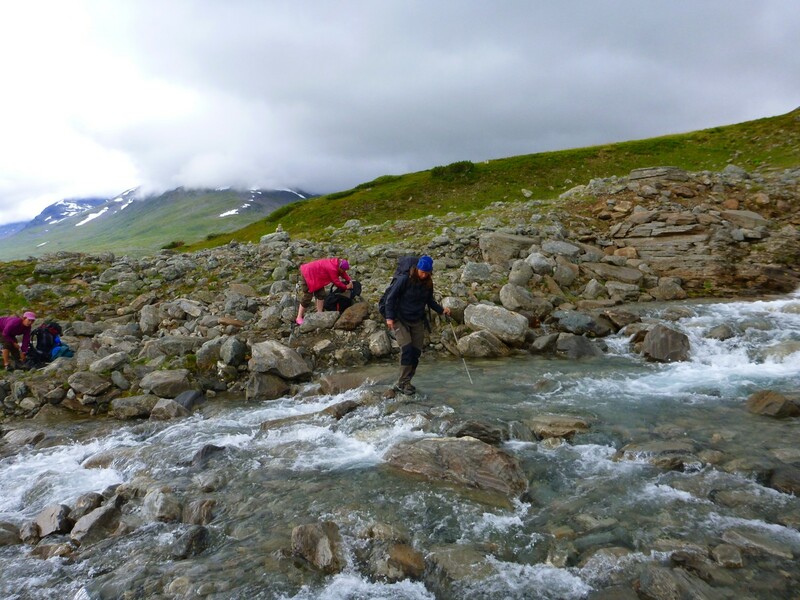 We had a stream crossing early on, but this one was not difficult. Notice in the photo above that Christian wears high leather boots. Everybody in the group had sturdy leather boots of some sort—except me. I wore my lightweight Merrell trail shoes. If you don’t look closely at them, they look like no more than running shoes, but the soles are sturdy Vibram material. These are the shoes I wear for my stream hiking in the Smokies—in warm weather. I am indifferent as to whether I get my feet wet. My waterlogged socks stay warm, and I can either wring them out or simply let the water work itself out as I move along. So by now I had decided to revert to my Smokies style of hiking. 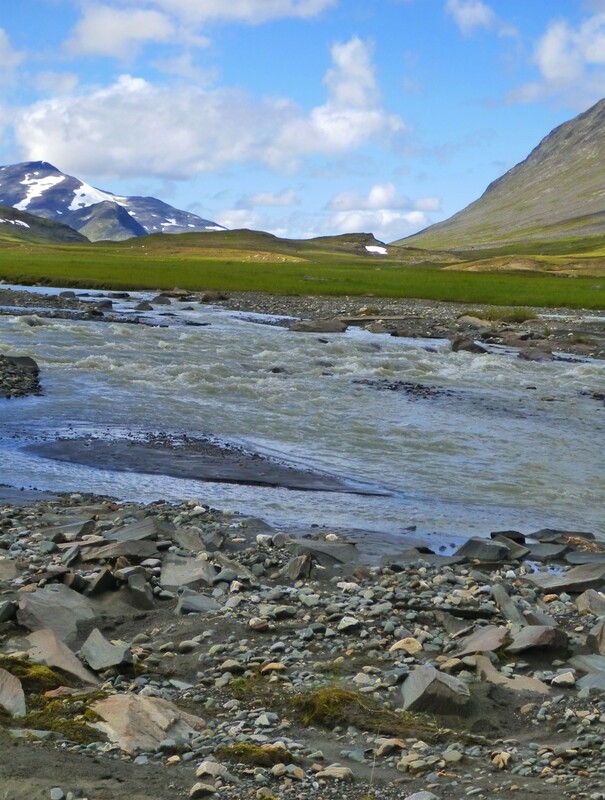 I simply waded through the water in my Merrells, and on the far bank I wrung my socks out. I always had plenty of time to do this while others in the group put on and took off their water shoes. I was still glad I’d brought the Crocs—I used them as camp shoes, with a dry pair of socks. After a while people began to comment on this peculiar approach, and at the end of the trip a couple of folks took pictures of my shoes. As we walked along, someone pointed out this pair of eggs. 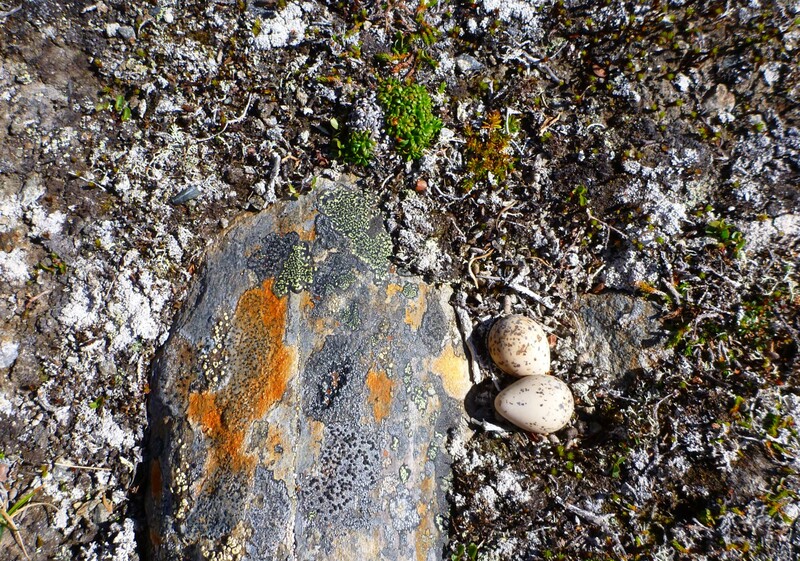 A pair of speckled eggs. Good-sized glacier between those peaks. 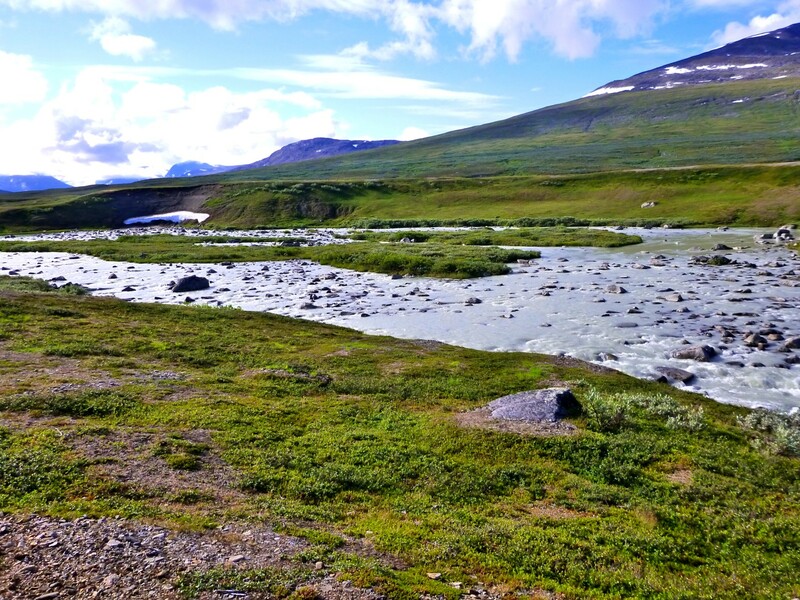 In the early afternoon we came to a major stream crossing. We stopped to have lunch before making our way across. With my experience of being swept downstream the day before, I stared at it apprehensively. However, it turned out to be shallow, so despite the fast current, I got through it without any trouble. I had also figured out that I needed to lean forward and keep my knees bent to keep my center of gravity from shifting backwards with the heavy pack. It wasn’t as bad as it looked. 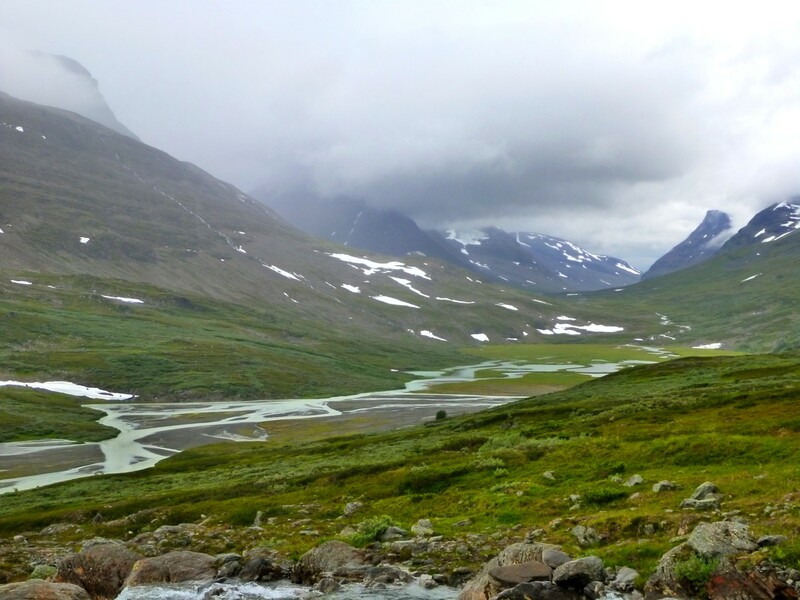 We were now headed toward a major crossroads of valleys in Sarek, where the Ruohtesvagge meets the Guohpervagge and the Alggavagge. 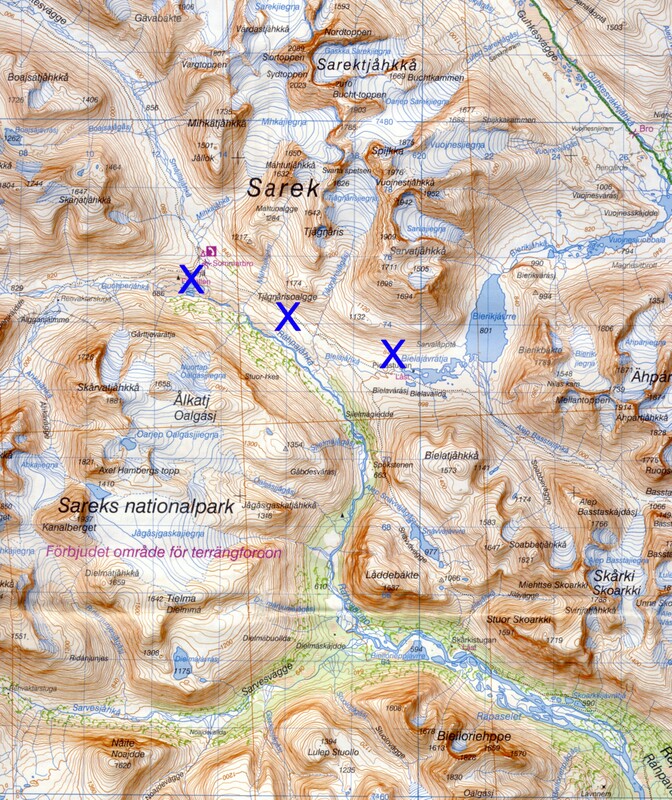 The blue X’s mark our route on Days Three and Four. The river grew wider as we went along, but we would have a bridge for the eventual crossing. I liked these islands of grass. During the last hours of that day’s walk, a young woman named Sofia led the way. I learned that she was an apprentice in the art of becoming a mountain guide. She did a fine job in picking out the best route among paths that forked around various obstacles. We also had in our group a very experienced man, Bjorn, who volunteers to assist in leading groups for the STF outings association. 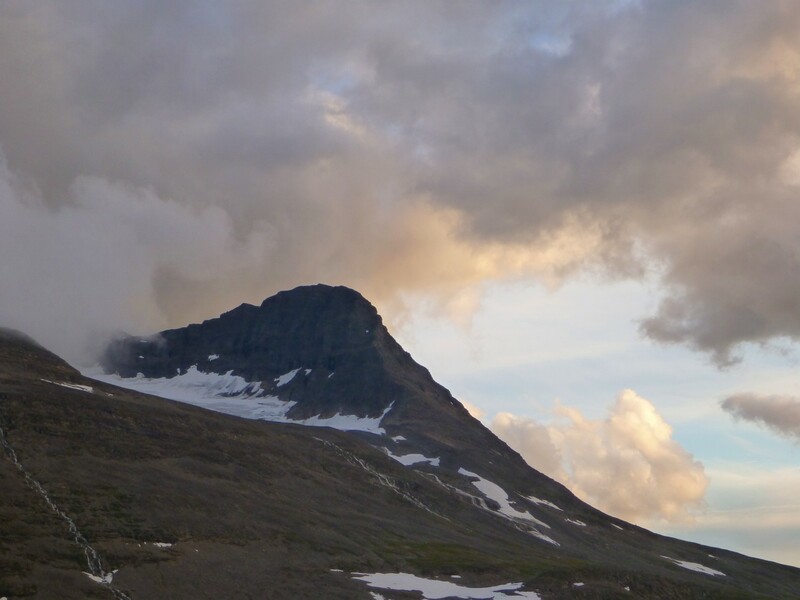 We arrived at our campsite for the evening, the central junction featuring several civilized items: an outhouse, a bridge (one of two in Sarek), and an emergency telephone. 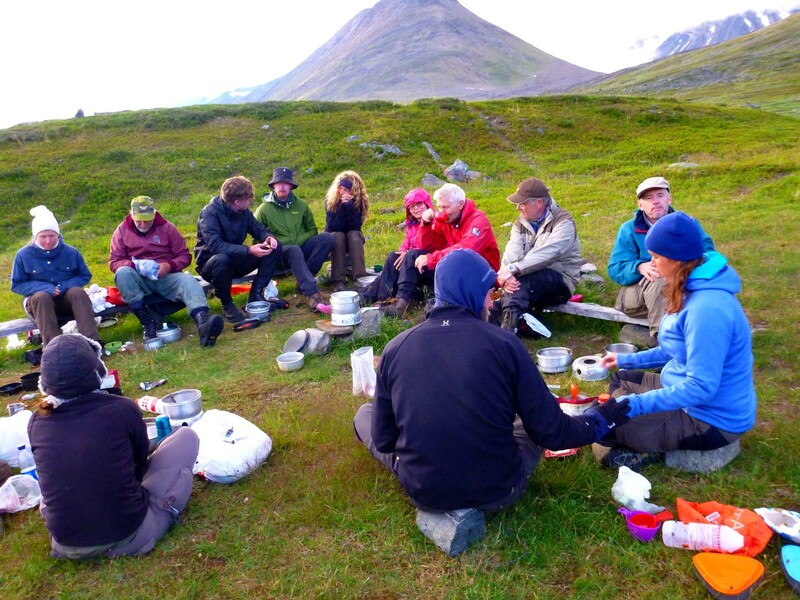 In this photo taken at our dinner that evening, Sofia is at left in blue jacket and Bjorn is next to her in red jacket. 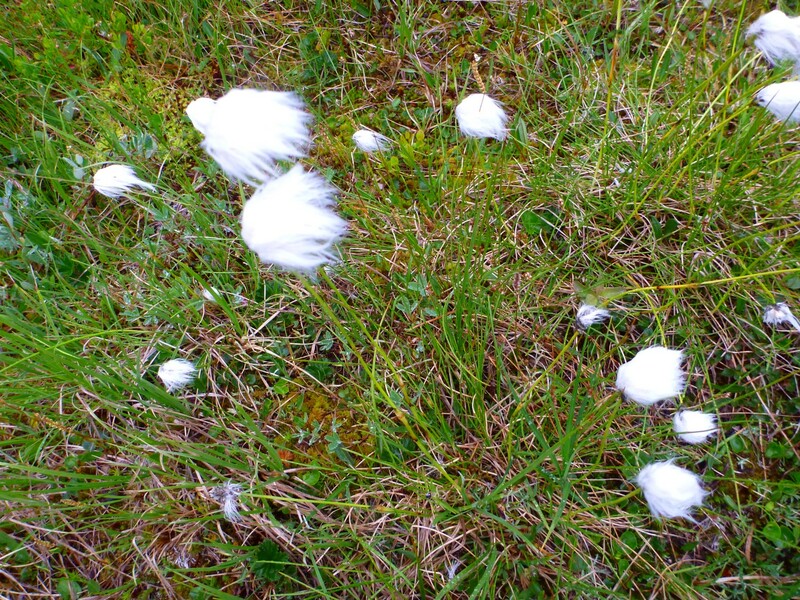 Posted by Jenny in bushwhacking, camping, hiking, travel. 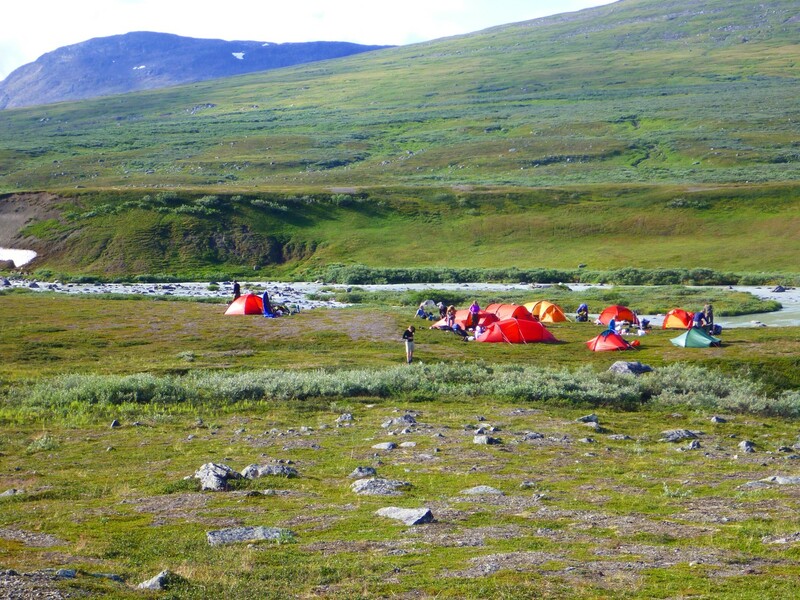 When we arrived at the bank of the Sjnjuvtjudislåhkå River—where we would cross the boundary from Padjelanta National Park to Sarek National Park—we had a nice flat area to camp on. The weather cleared, after a fit of rain in the afternoon, and we had a pleasant evening. We set up our tents. By now I was getting familiar with the tent, finally understanding that the orange tent poles and the purple tent poles went into the orange and the purple slots, respectively. So we all created our tent community. I didn’t think too much in the evening about how we would have to cross that river. But in the morning, I started thinking about it. I gazed at the river. I could see there was an island in the middle. I understood the basic law of current: it is best to cross in a wider area where the flow spreads out, rather than a narrow area where the flow is pinched and becomes more intense. The river we had to cross. For all the time I’ve spent journeying up streams in the Smoky Mountains, I should have been able to do it with no problem. But I ended up having the biggest problem of anybody. I went “mental.” What I mean is, I overthought the situation and worried about it—probably for the very reason that I shouldn’t have worried about it—and I had a big problem. I started getting extremely anxious about it. This is part of who I am, unfortunately, a person who worries about things to the point that they actually do become worrisome. After our cuckoo-clock wake-up and breakfast, Christian gathered his flock to give us some guidance. 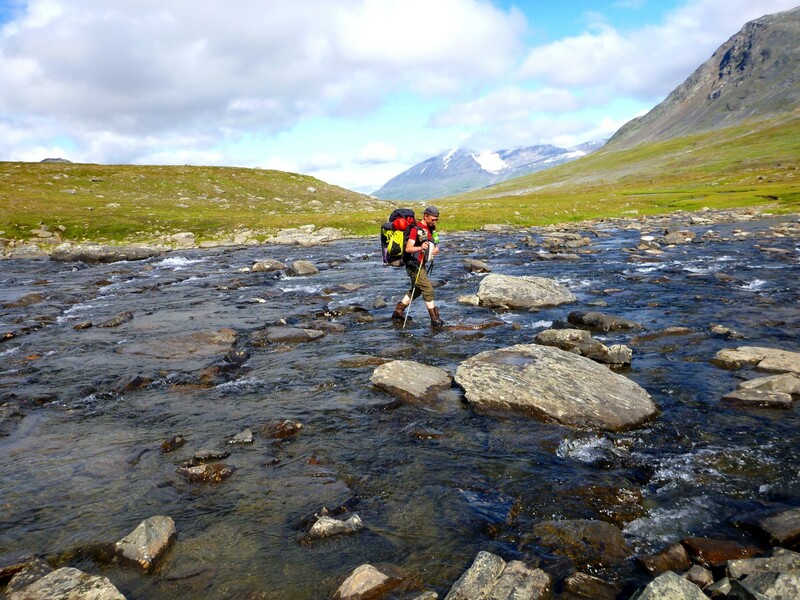 When we crossed the stream, he said, we should unfasten the belts on our backpacks in case we had to take them off all of a sudden. We should use our poles to probe the stream bottom as we crossed. 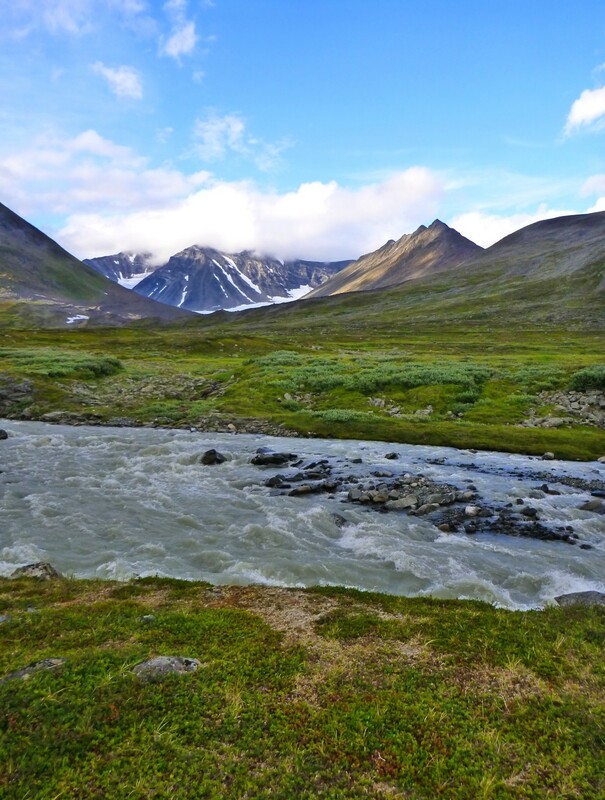 One of the challenges of this stream was that the water was completely opaque with glacial silt—it looked like milk rather than water—so that it would be nearly impossible to see the bottom. We finished breakfast and packed up. Since the crossing was very close to where we’d camped, a lot of people put on their water shoes right to start with—sandals or plastic shoes. I put on my Crocs. But then I looked at the river and decided that I didn’t want to use those plastic soles—I’d keep on my hiking shoes, lightweight Merrells with Vibram soles, instead. The traction might be better. So I switched my footwear. We walked to the crossing point. Three or four people made it across to the middle island, and I decided I might as well go. I started across. The flow of the river was powerful. 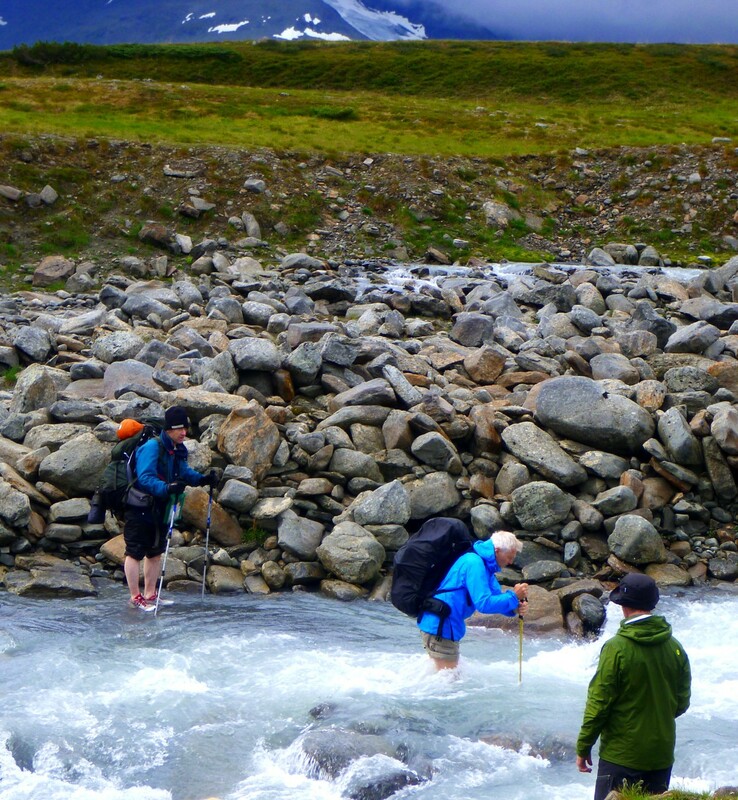 I made my way tentatively across the uneven stones, and Christian called over to me, “Face upstream!” The idea was to plant my hiking pole upstream and extend my forward foot until I found a point of stability, transfer my weight to that foot, etc. Repeat. The problem: I was so anxious about it that my muscles became very tense, which made it harder. Somewhere along the way, with the roaring water and the heavy pack on my back, I lost my balance. My center of gravity shifted backwards, and all of a sudden, there I was, floating rapidly downstream! I was carried along swiftly by the current. The one thing I can say for myself is that I didn’t panic. I realized that I needed to find a rock to hang onto. I passed one, two, maybe more such rocks, and finally found one that I could cling to. So there I stopped myself, finally. Christian was heroic. He was able to come over to where I had landed, take my waterlogged pack from me, and give me a helping hand. Amazing! He helped me over to that middle island. But I was pretty shaken up. I couldn’t manage to put that pack back on. I waited a few minutes until I collected myself, and then I was able to complete the journey across the river—the second part was easier, with less of a current, than the first. Somebody carried my pack over for me, either Christian or Bjorn, who was a second leader. I was so preoccupied that I couldn’t even observe the details. In the course of being submerged, my pack had become pretty wet and of course a lot heavier. Some of my clothes got wet. Fortunately, my sleeping bag was only slightly dampened. 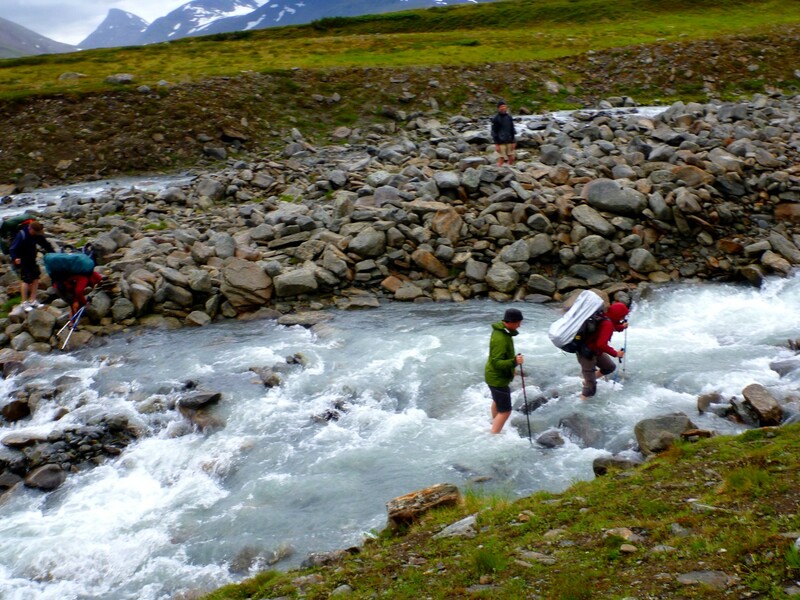 Once across the river, I struggled to put my pack back on, and it was difficult. We stopped for a break at the top of a hill on the other side. I wrung out some of my clothes and dried them out in the sunshine. 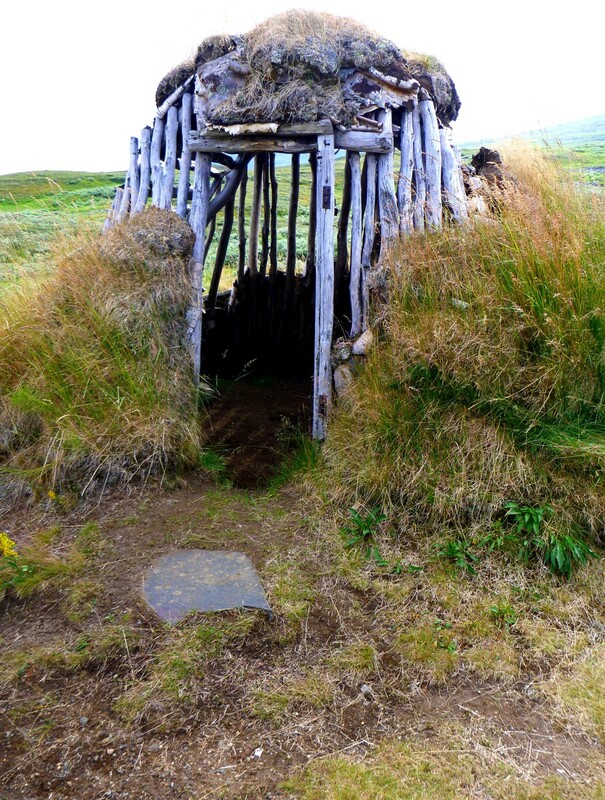 We started hiking again and passed a Sami hut that was used for seasonal care of the reindeer. 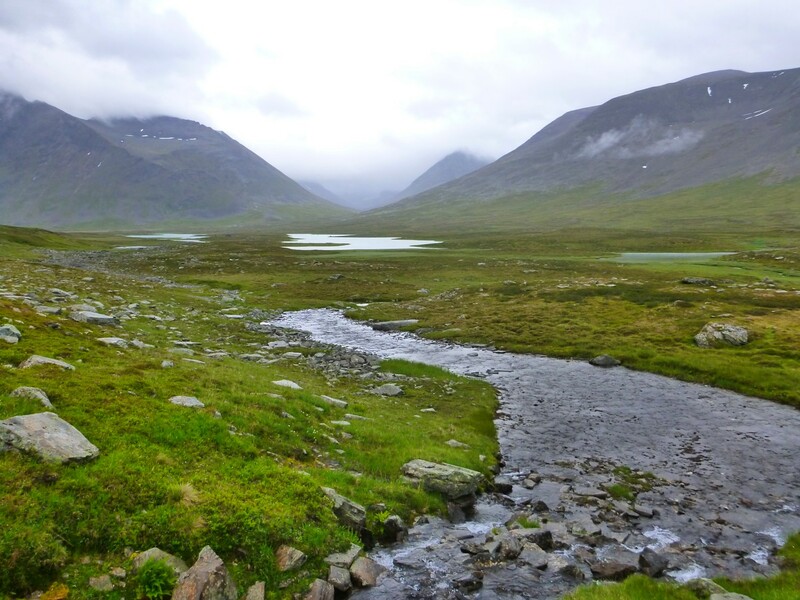 We continued along a wide valley that gradually bent southward toward the Ruohtesvagge, one of Sarek’s major valleys. 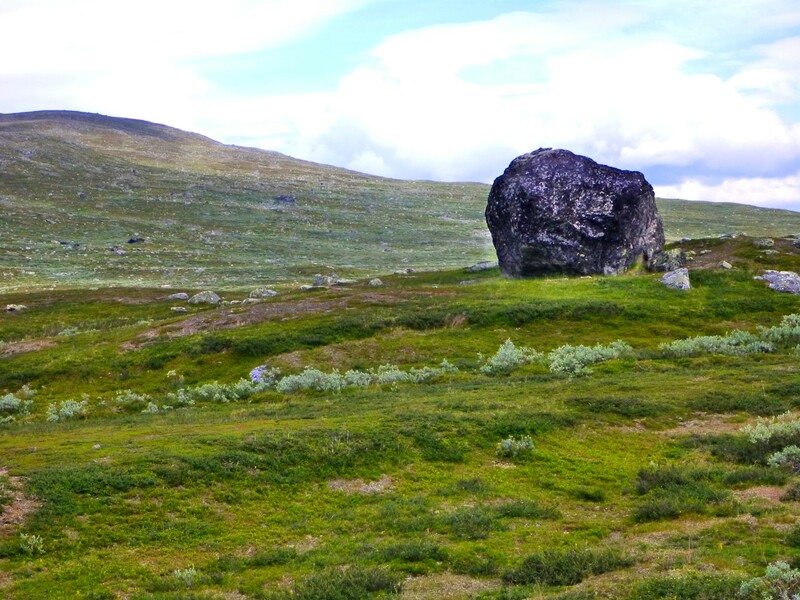 We passed an interesting “glacial erratic,” a big boulder that had been deposited there by glacial activity. Boulder carried and deposited effortlessly by glaciers. During this time I was conversing with and getting to know a fellow named Anders who was delightful to talk with. I learned that his work involved providing home visits to elderly or disabled persons, and I could imagine that they must appreciate his visits very much. Once again, the weather started to deteriorate, but this time we didn’t get the bout of heavy rain we’d experienced the day before. 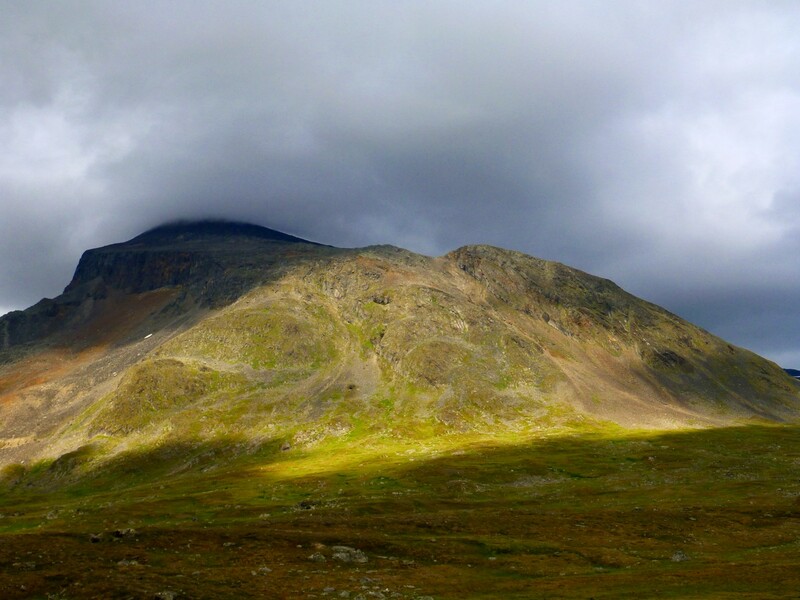 Rain and sunshine next to each other—typical of Sarek. Finally we arrived at a lovely campsite on a flat area near the stream. I saw reindeer antlers on the ground. 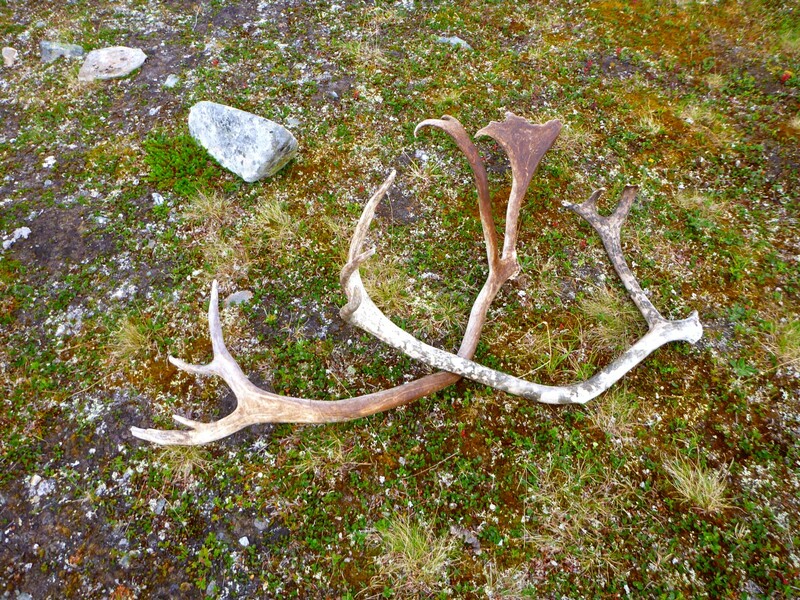 It was pretty easy to find antlers on the ground. 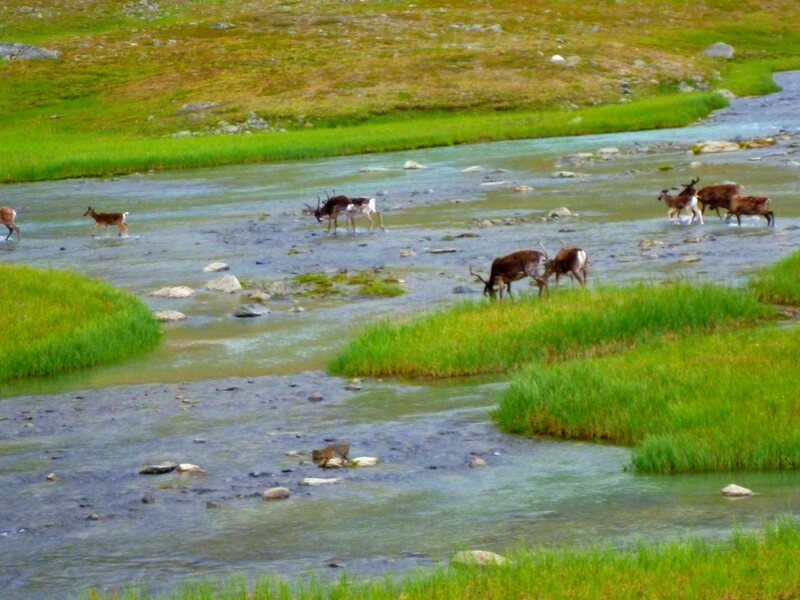 And later that evening, a great herd of reindeer streamed out of a side valley and crossed the stream in front of us as we watched. It was one of those silent, gigantic happenings of nature that we are blessed with, if we see it. I am fortunate to have experienced this.